Jatiya Party, one of the partners of the Awami League-led Grand Alliance, on Friday presented its election manifesto with a 18-point pledge, including formation of provincial government, to ensure good governance and consolidating democracy. 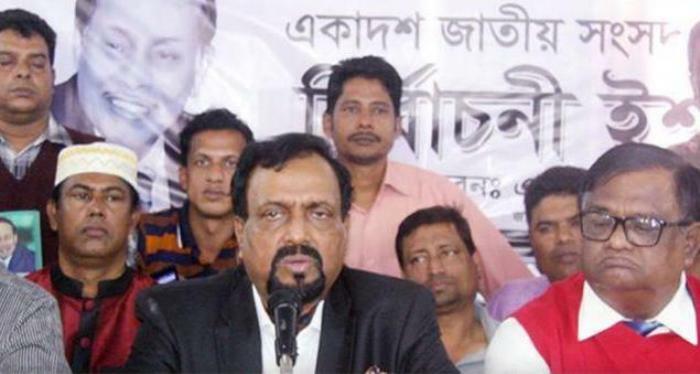 Party Presidium Member Ruhul Amin Hawlader unveiled the manifesto at the party Chairman HM Ershad’s Banani office. “Jatiya Party’s first commitment for governing the country in the days to come is to restore democratic atmosphere, flourish democracy and establish good governance in the country,” he said. Hawlader, also the special assistant to Jatiya Party Chairman HM Ershad, said their party will introduce a provincial system bringing change to the existing central government structure if it returns to power through the upcoming election. He said their party has also a plan to turn the country’s eight divisions into eight provinces. The Jatiya Party leader said they will increase the number of parliamentary seats to 380 from current 350 keeping 30 seats reserved for the minority communities. Party’s other pledges include, introducing a full-fledged upazila system, bringing a change to the country’s election process, reforming the education system, extending healthcare facilities, taking steps to contain terrorism and ensuring the independence of the judiciary. Hawlader presented the party’s manifesto as Ershad has been staying in Singapore since December 10 for receiving treatment. Before going abroad, Ershad appointed Ruhul Amin Hawlader as his special assistant to discharge all the organisational responsibilities of the party chairman in his absence. Hawlader said he presented the party’s election manifesto following the directive of Ershad.